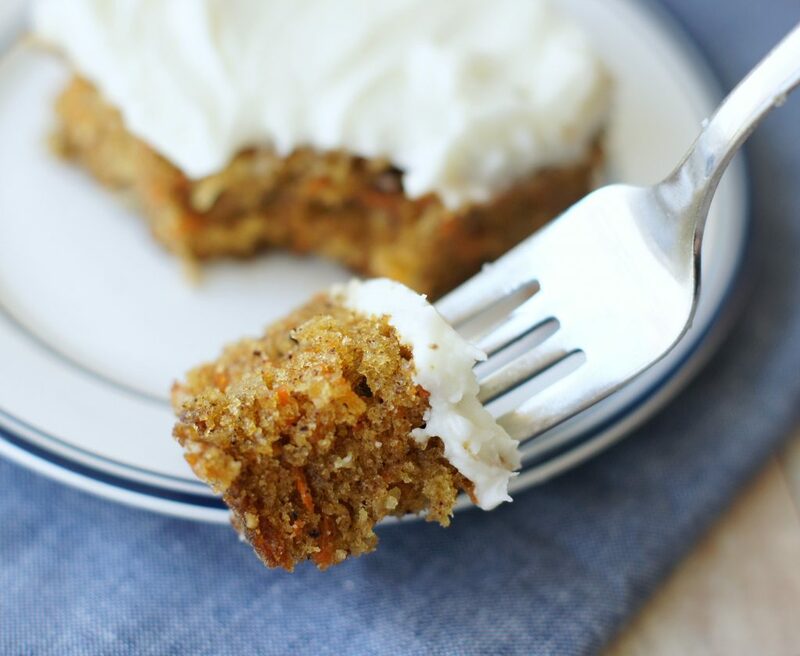 This Carrot Cake with Cream Cheese Frosting is delicious! So simple to make with simple, basic ingredients. Topped with cream cheese frosting, it just doesn’t get any better than this. 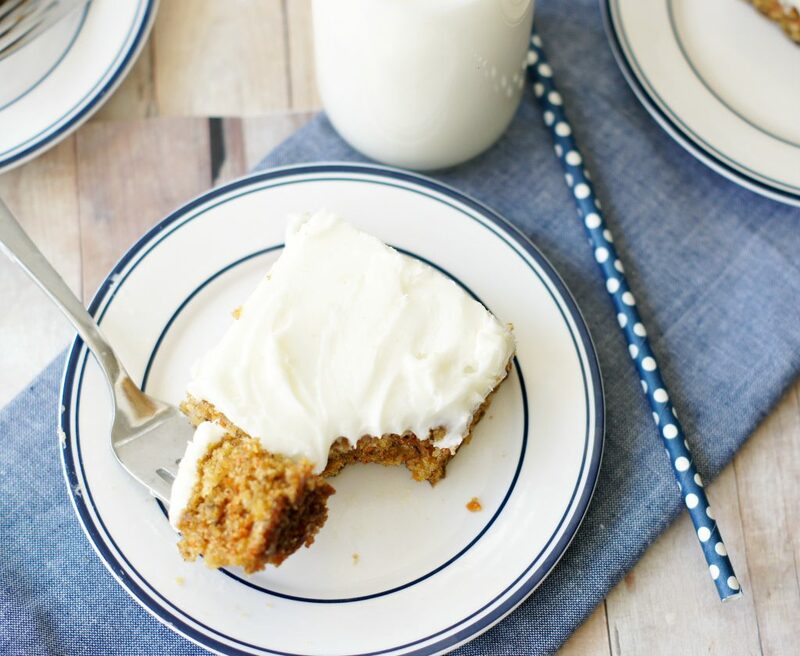 This Carrot Cake with Cream Cheese Frosting is probably one of my all-time favorite cakes in the history of ever! I’ve been making it for years, it’s my go-to recipe. With Easter just a few days away, I thought this would be a great cake to share with you in case you were looking for a dessert for Easter Sunday. 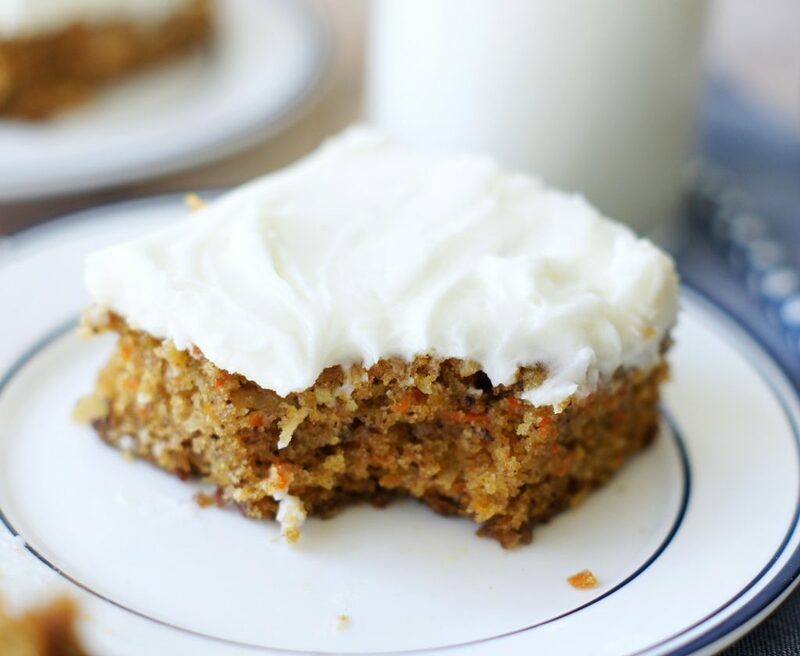 If you ask me, you just can’t go wrong with carrot cake slathered in cream cheese frosting. Now I know there are some carrot cake haters out so if you’re one of them, I’m sorry, you just don’t know what you’re missing out on. I also know there are carrot cake lovers who absolutely love raisins in their carrot cake and to those people I say Ew, yucky, but I still love you. I am not a fan of cooked raisins, they absolutely DO NOT BELONG in carrot cake. Whenever my mom would make it, I would pick them out and wonder why she had to go and ruin such a good thing. But feel free to add raisins if you’d like, I won’t judge you. 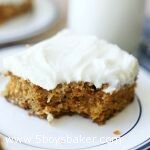 I love this carrot cake because it’s so simple to make, there are no weird ingredients and it is delicious every time I make it. So if you’ve been in a quandary about what to dessert to make for Easter Sunday, then I got your back today. This really is, in my opinion, the best carrot cake ever. Simple, soft, tender and absolutely delicious! This can also be baked in two 9-inch round or square cake pans if you'd like. I also like to place my 9x13 pan on a cookie sheet in the oven, this helps prevent the bottom from getting too brown before the center of the cake is done. In a large mixing bowl, combine sugar and oil and mix well. Add vanilla and eggs, one at a time, beating until creamy. Add flour, salt, baking soda, cinnamon and nutmeg and mix until well blended. Add grated carrots, coconut and pecans and beat until blended. Divide batter into a greased 9x13, making sure you get it as even as possible. Bake 40 to 45 minutes or until a toothpick inserted in the center comes out clean. When completely cool, frost with Cream Cheese Icing. Beat the cream cheese and butter together in a mixing bowl, for about 2 minutes. Add the powdered sugar and vanilla and beat until smooth. Spread on cooled cake. Also, for a variation, sometimes I had the zest of an orange to the cream cheese frosting, it's absolutely delicious! I'm not a fan of nuts in baked goods, but I actually don't mind a few chopped pecans in carrot cake. Sometimes I add them, sometimes I don't. It's up to you if you want to add the nuts. You could also sprinkle the pecans on the frosting if you don't like them in the cake.